It was a Friday noon. While I was getting out of a mosque after saying the Jummah prayer, a middle aged man came to me begging money for his child who, he said, was suffering from an incurable disease requiring a huge sum of money; plus, he had been starving since last night. Taking pity on him, I helped that man with some money. That afternoon, I went to the rail station with a senior photographer friend of mine for taking random snapshots. At one point, when we were standing on a foot over-bridge with our cameras, we saw some drug addicts lying under the bridge. Suddenly I heard someone ask my friend to take a photograph of them. I looked at them and to my surprise I found that one of them was the person I gave alms that noon! He wasn't completely sober and couldn't even walk properly. We left that place in no time. We help these people, believing that they are destitute. But in real life, they just act to collect money for buying drugs. So, whom can we trust? A few days ago, I had the chance to visit Cox's Bazar which is in the preliminary list of the Seven Natural Wonders of the World. From the moment I arrived there, I was fascinated by its indescribable natural beauty. But just after passing a few days, I became desperate to see my bustling city Dhaka, which is full of problems, yet appeared at that time to be an essential part of my identity. It was totally a new experience for me. In fact, it seemed that through this journey I not only explored one of the most beautiful places of the country, but also discovered myself in a new light. This is how I came to know that under the surface of endless disgust I have always nurtured a deep-seated love for my dirty, rubbish-strewn city. As I came back, I also realised that Dhaka can be rid of all dirt and filth if the DCC authorities in association with other government bodies take proper actions. The traffic problems can also be solved but for that to happen the government needs to be far more interested in people's welfare than the politics of vendetta. Last Thursday I was returning to my house after appearing at my A level exam in Basundhara City. I was on a bike with one of my friends. As usual there was a tailback compounded with sound pollution and people walking all over the road and sidewalks. After a while when we were moving towards the middle of the road, we noticed abruptly that the front wheel of the bike was sliding slowly off the road into a hole or something. It was evening and quite dark too. In fact, it was quite a deep as well as wide ditch filled totally with rain water in a way that none could predict. It was because of my friend's skill at controlling his bike that he could instantly stop it right at that moment. Later, my heart came to my mouth when I was pondering over the whole thing. It could have resulted in a dire accident taking heavy toll on us. Although private cars, buses and CNG-run three wheelers may have less problem for this, but for bike riders this type of holes are like death traps. So I thanked the almighty for saving us thus. 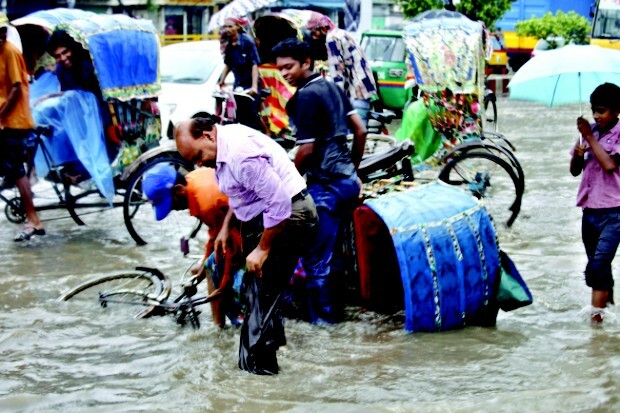 Owing to the fact that there is a huge number of bikers in Dhaka, the authority must think about the matter seriously if they really care about the safety of the commuters.